The opening sequence of the collection “Manhood” looks at the insular world of baseball, shedding light on the complexities of gender, boyhood, and coming of age. 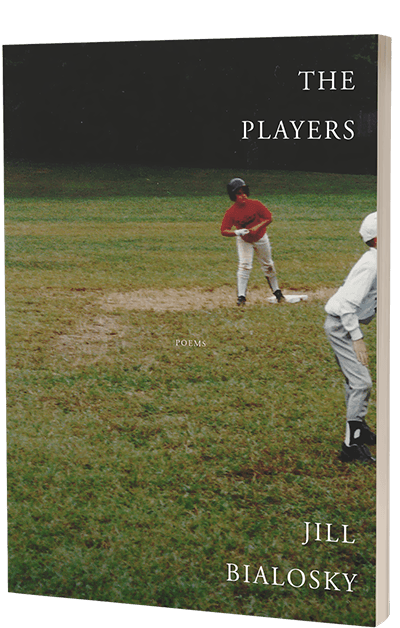 The poet captures the electrifying, proud language of baseball talk, channeling the tone and approach of the young men she observes as a mother and bringing poignance and deeper understanding to the transaction between herself as observer and the young men she sees growing into adulthood. “American Comedy” is a sonnet sequence about the absurdities and realities of modern domestic life; figures in literature are the players in “Classical Education.” The final section, “The Players,” makes a forceful and disturbing revelation as to how generations hand down both strengths and weaknesses. Exploring the nature of attachment on many levels, The Players brings us Jill Bialosky at her best in poems that find a new language to describe the rich and universal story that is modern motherhood. “So alive and stirring are these poems of boys ripening into men as they perform a ritual of skill and competition, the lyrics gather force and dynamism like music—think Gershwin, think Copland. These summer poems convey a wondrously intimate grandeur as Bialosky captures the pivots and pitches, lunges and slides, and the quick, cutting rhythms of game talk. Here, too, are the baselines of family, the scorekeeping of community, the perfect mesh of body and mind . . . . Bialosky writes poignantly of the seashore, of life sweeping in and rushing out as a woman cares for her increasingly frail, forgetful mother while watching her son shed childhood. A sun-spangled and deep-shadowed collection in which the archetypal is laced tightly into precious, ordinary life.